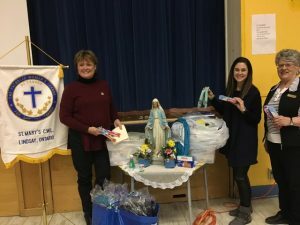 Members and friends of St. Mary’s Parish Council (Lindsay, Ontario) gathered and donated over 1,100 personal items as part of the League’s project H.U.G. (Helping, Understanding, Giving) at the January 16th meeting. The packages and a financial donation were presented to guest speaker Carly Veitch of the Boys and Girls Club of Kawartha Lakes.